Don't wait until autumn to make these delicious cranberry muffins. They can be enjoyed all year round using frozen cranberries. They're great for a breakfast treat with coffee or tea, or for a tasty snack during the day. 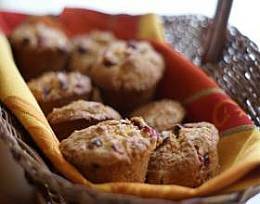 You may substitute orange juice for the milk in this recipe for a Cranberry-Orange Muffin. Preheat oven to 375 degrees F/190 degrees C. Grease or spray with non-stick cooking spray a 12 cup muffin tin. Set aside. In a medium bowl, combine cranberry halves with confectioners' sugar. Toss well. Set aside. In a medium bowl, sift together flour, baking powder, baking soda, salt, ground cinnamon (optional) and granulated sugar. In a small bowl, combine beaten egg, milk and melted butter. Pour mixture into the above flour mixture. Mix just until dry ingredients are moist. Fold in cranberry mixture. Spoon batter into the 12 prepared muffin cups (batter will be thick), filling each cup about 2/3 full. Bake in preheated oven for about 20 to 25 minutes or until a toothpick or cake tester inserted in muffin center comes out clean with no moist crumbs. Let muffins cool in muffin tin for 10 minutes, then transfer muffins to a wire rack to cool completely. They had a very nice flavor. I used the orange juice instead of milk. The cinnamon was a nice added spice. I will definely use this receipe again. I used orange juice and made six giant muffins with this recipe. They are too pretty to eat. LOL. They're all gone!